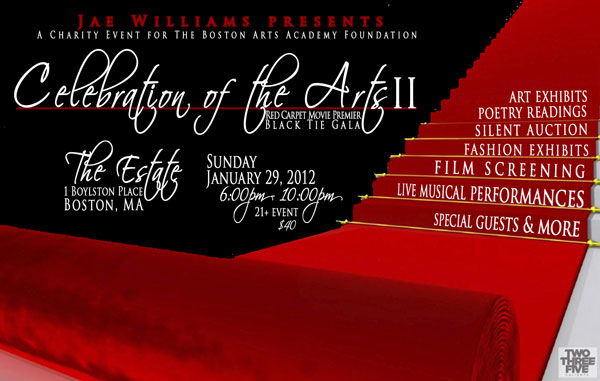 The 2nd Annual "Celebration of the Arts" Red Carpet Charity Event is scheduled to be held Sunday January 29th, 2012 from 6 p.m. to 10 p.m. at the popular venue Estate, located in downtown Boston. This event, organized by local filmmaker Jae Williams of Forever Ink Productions, will raise money for the Boston Arts Academy Foundation, and is slated to bring together a line-up of the Boston area’s best and brightest young talent in performing arts, music, design and fine arts. The Boston Arts Academy (BAA) is the city’s first and only high school for the visual and performing arts. It was founded on the conviction that academics and the arts are equally important to student development and achievement. The show will be hosted by KISS 108 FM radio personality Rich DiMare, and there will be a spoken word poetry performance by Hot 97 Boston's own Ms. Toya Tiffany, reading from her latest book, The Essence of My Totality. Live musical performances from popular local artists will include former Making the Band contestant Makio, rock band Prospect Hill, R&B sensation Andrea LeClaire, Pop/ R&B artist Renee Marcou, Hip Hop Soul songstress Kao, and also featuring an appearance by members of the talented International Band. 0 Response to "2nd Annual "Celebration of the Arts" - 1/29"